B0781. 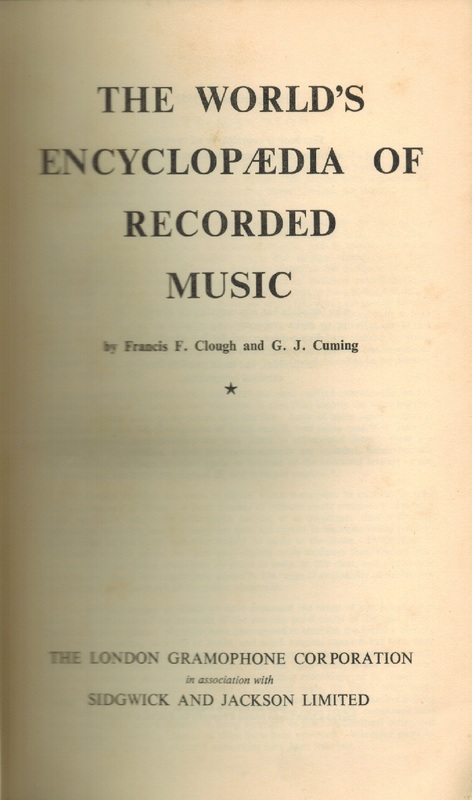 THE WORLD’S ENCYCLOPEDIA OF RECORDED MUSIC [WERM], Vol. I. F. F. CLOUGH & G. J. CUMING. London Gramophone Corp. & Sidgwick-Jackson, 1952. 890pp. (Incl. First Supplement, 1950-51.). 564pp. This Original 1952 UK Edition went out-of-print very quickly. "The World's Encyclopaedia of Recorded Music, published in an original volume and three supplements during the 1950s, is an indispensable vade mecum to classical recordings on electric 78s and monaural LPs. Its scope is worldwide, as the title says, and the compilers, Clough & Cuming, not only cast their net very wide but did a scrupulous and scholarly job in making the listings more accurate, sometimes, than in the records' own documentation.